The St. Weiler is a hybrid dog crossed between the Rottweiler and the St. Bernard. 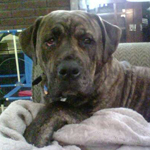 The English Mastweiler is a hybrid dog crossed between the Mastiff and the Rottweiler. The Labrottie is a hybrid dog crossed between the Labrador Retriever and the Rottweiler. 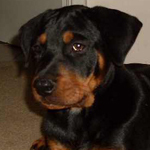 The Rotterman is a hybrid dog crossed between the Doberman Pinscher and the Rottweiler.